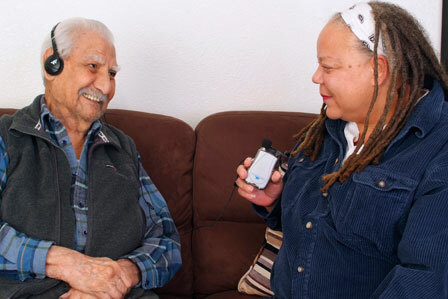 Two people using an assistive listening device. Ability Tools operates a Device Lending and Demonstration Center (formerly Device Lending Library) program throughout California. The following agencies contract with Ability Tools to provide short-term loans of assistive devices and gadgets that can help you live independently. Whether your need is temporary or you would just like to try out some devices before you buy, our Device Lending Libraries can provide free, short-term loans for up to 30 days of equipment such as portable ramps, AAC devices, magnifiers, computer software and more. Device Lending and Demonstration Centers can ship most items to borrowers throughout California. To see what devices are available, visit the AT Exchange. Contact: Vacant at this time.